A Choice H2O Dispenser Cap is designed to insert one of four additives to a bottle of water in a single use. Our patent pending design keeps the additives fresh and leak free until distribution of product is desired. Great for consumers looking for choices! A second version allows the consumer to use all four ingredients whether it be flavors, vitamins, energy enhances, nutraceuticals or even medications one ingredient at a time or all four at once. A key feature is little to no impact to the bottler. 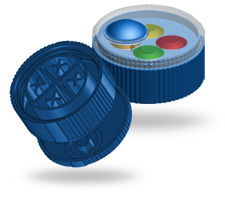 All physical dimensions are similar or vary a small amount to existing 28mm caps. Copyright © 2019 ChoiceH2O.com. All Rights Reserved.